Central vacuum systems are all about convenience and power. And nothing does this better than a Beam central vacuum. Here are some benefits to consider. The hose is so lightweight that pulling it around is almost effortless. It easily reaches into all the corners of your home. No need to maneuver a vacuum around furniture and corners, the hose slides around these with ease. And no more trying to balance the vacuum on the stairs while you clean. The fingertip controls provide you with complete control of your vacuum right under your thumb. You won’t have to reach for, or step on switches to turn you vacuum on and off. Most homes today have a variety of different surfaces to clean – hard floor surfaces, area rugs and wall-to-wall carpet. 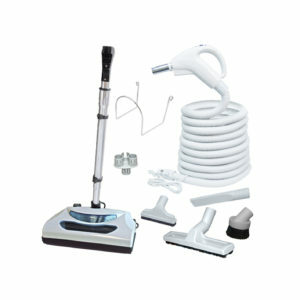 A central vacuum has a range of accessories to thoroughly clean all surfaces and they can be switched around with ease. Tired of listening to the noise of your vacuum? The central vacuum canister is located in a remote location of the home, away from the area that you are cleaning so you don’t have to listen to it. And check out the Precision power nozzle, it’s very quiet and makes cleaning your carpet easier than ever. And about the Precision power nozzle, do you get frustrated having to remove the hair that collects around the brush roller? Push the ‘Brush Roll Clean’ button on the power nozzle and it cleans the hair off by itself. All portable vacuums recirculate some level of dust back into the air. With the Beam central vacuum, you can remove 100% of all dust that you pick up form you living environment. Vent the machine outside or install it in your garage and even the smallest particles of dust are removed from your home. No filters to clean or replace. Just empty the dirt receptacle once or twice a year. Maintaining your vacuum is so easy. At Cardy Vacuum, we have one of the largest Beam Central Vacuum and accessory selections in Eastern Ontario. Visit our East or West end locations and see for yourself the benefits of a central vacuum.